Some of the biggest effects of climate warming are being observed in the polar regions; but the climate in mountainous regions are also rapidly changing. For example, the rate at which climate change is happening in the European Alps, is more than double that of the average across the Northern Hemisphere. Plants are moving pole-ward and uphill trying to keep up with the climate they thrive in. Clear examples of this are treelines that are advancing uphill (but that doesn’t happen everywhere). We know that plants adapted to cold climates are being driven out of their natural ranges – and in the mountainous areas they might run out of space! However, beyond observing changes in the distributions of species, we still have a very poor understanding of the processes that accompany the climatic changes occurring in mountainous areas. Sweden-based Dr. Jordan Mayor and David Wardle (SLU in Uppsala), organised and set up a study with an international research team, including myself, to investigate whether, at a global scale, we see universal shifts in ecosystem properties across elevational gradients. Our paper was published in Nature this week. The long-term and broad-scale changes that are instigated by climate change are hard to study using experiments. So instead, we used elevation as a surrogate for climate warming. This is possible because, as a consequence of warming, in 80 years from now, any particular elevation is expected to experience the temperature that is currently found 300 meters lower. Studying the properties of vegetation and soil along elevational transects near the treelines in seven regions (including the European Alps, Hokkaido Japan, Rocky Mountains USA-Canada, Patagonia, New Zealand, and Australia) allowed us to predict the effects of warming across temperate mountain regions world wide. We found remarkably consistent patterns across these extremely varied mountain regions. Decreasing elevation (increasing temperature) consistently increased the availability of soil nitrogen for plant growth – so we can expect that warming will consistently improve plant nitrogen nutrition. However, plant phosphorus availability was not controlled by elevation (and thus temperature) in the same way. This resulted in a pattern where the balance of nitrogen-to-phosphorus in plant leaves was very similar across the seven regions at higher elevations, but diverged greatly across the regions at lower elevation. This means the nitrogen-to-phosphorus ratio is constrained by low temperatures but at higher temperatures, regional factors and differences between regions become more important. We also found that with increasing temperature, the patterns in plant nutrition were paralleled by changes in the amount and quality of organic matter in the soil and the microbial community. Our study allowed us to untangle the effects of vegetation type (forest below treeline, and alpine above it) on these patterns, and we found that the changes were at least partly independent of any effect of the vegetation. This means that effects of warming on ecosystem properties will occur irrespective of whether treeline shifts up-slope. Our results not only suggest that warming could affect the way that plants grow, but also that these changes are linked to effects of warming on soils, especially the cycling of key nutrients that sustain the growth of plants. It provides evidence that expected temperature changes over the next 80 years have the potential to greatly disrupt the functional properties of mountain ecosystems and result in increased disequilibrium in the above- and below-ground ecosystem components, and the links between them. The changes in mountain ecosystem processes identified in this study may have important implications for which plants grow in mountain ecosystems (affecting biodiversity), and the potential upward shift of treelines. Such shifts are expected have an effect on the local climate itself, and may indeed speed up the warming process, as forests reflect less and retain more heat than lower, less green vegetation. We used elevational gradients to predict what will happen in mountainous ecosystems as the climate warms – this is a powerful approach to understanding the processes that are occurring at an increasing pace in these areas. However such changes are also likely to occur in lower lying areas. Much remains unknown about how human-driven climate change will affect the Earth in the long-term and over larger spatial scales. 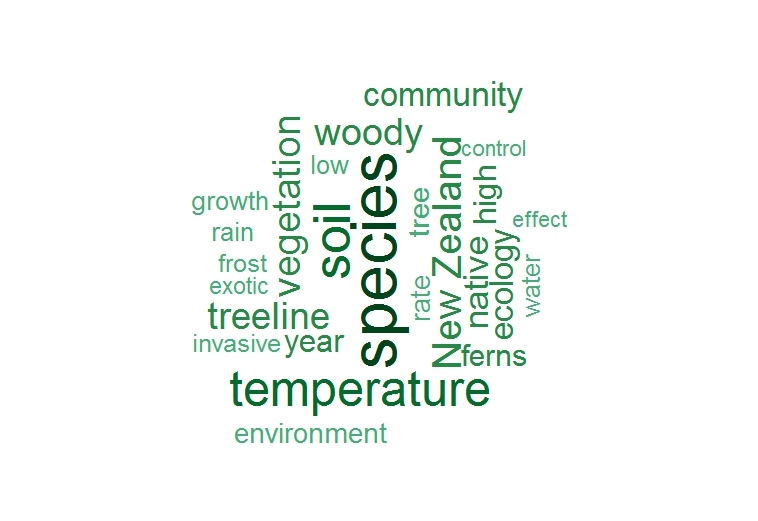 Categories: Research update | Tags: climate change, Global, Mountains, New Zealand, treeline | Permalink. In 2011 and 2012, I had the privilege of visiting the Xinjiang Institute of Ecology and Geography in the far north-west of China, and I’ve been collaborating with this research group ever since. The region’s capital city Urumqi is one of the most continental places on earth – it is the city the furthest away from any ocean (> 7000 km). The landscapes here are unlike anything that I had ever seen in the Pacific or in Europe. Large parts of the province of Xinjiang are covered in deserts, including the Taklamatan, Gobi and Gurbantünggüt deserts. Arid and semiarid ecosystems comprise more than 40% of the earth’s terrestrial surface, and these systems sequester a lot of carbon; they are a lot more productive than they look, contributing 30-35% of the global net productivity. In fact, recent evidence suggests that the variation of the global carbon cycle from year-to-year will be less and less due to tropical rainforests and more due to semiarid ecosystems. However, remarkably little is known about the things that (may) affect the carbon cycle of these systems. One obvious driver of the composition and productivity of desert ecosystems is precipitation, because only after rain, the vegetation appears to ‘become alive’. In central Asia, desert vegetation communities can typically be divided into shallow-rooted and deep-rooted species, which have different water-use strategies. Previous work of my colleagues showed that the main component of the community (a shrub named Tamarix) is one of these deep-rooted species that relies on groundwater throughout the whole growing season, and that its productivity doesn’t respond to precipitation. So if it isn’t the shrubs that are responsible for the huge variation in productivity in response to rainfall, what is? Liu R, Cieraad E, Li Y, Ma J 2016. Precipitation pattern determines the inter-annual variation of herbaceous layer and carbon fluxes in a shrub-dominated desert ecosystem. Ecosystems 19 (In Press). Both the long-term observations and experiments showed that sufficient pre-growing season precipitation (between November to April, mostly falling as snow) led to more germination and growth of shallow-rooted annual plants. Only if this was followed by high-frequency rain during the growing season, were these plants able to survive and use that rain to increase community productivity. This would lead to community productivity as high as has been recorded in grassland and forest ecosystems. So, it is the little guys, like grasses and these annuals below, that make the difference in turning this desert from a source into a sink of carbon – but only if it snows and rains enough, AND at the right time! This study shows how important year-to-year variation in precipitation and community composition is to the amount of carbon stored or released. It also highlights that any predicted changes in the frequency and seasonal pattern of precipitation in this region (and elsewhere) due to global change will have important ramifications for the regional and global carbon cycles. Invasive species can have detrimental effects on ecosystem services, including food security and indigenous biodiversity. Similarly, climate change has been predicted to affect global food provision and the stability of ecosystems. Many studies assess the direct effect of either of these issues facing today’s world; however, of course they operate in tandem and this can create complex effects. While it is well established that climate change may facilitate the abundance and/or range expansion of invasive species, it is less known that it may also impact the ability to control and manage this invasion. If, for example, climate change results in the increase in abundance of an invertebrate crop pest, and at the same time in a decrease of a natural pest control agent (for example, insectivorous birds), then climate change can accelerate the impacts of invasions, and create a ‘double whammy’ for the receiving ecosystem. Similarly climate change may alter the effectiveness of ways to control invasive species. In a recent article, we show that increasing air temperatures over >60 years in New Zealand has reduced the window of opportunity to effectively control an invasive mammalian pest (European rabbit Oryctolagus cuniculus – using Central Otago, South Island, as an example). Anthropogenic control of invasive vertebrate species is most effective in times when natural food is limiting. 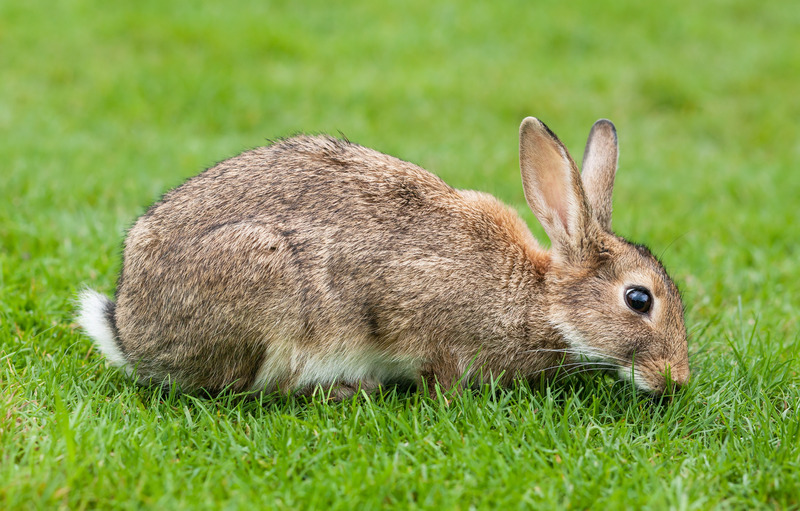 In the case of rabbits in temperate southern New Zealand, the most effective period of control is during the coldest period in winter, when temperatures are sustained below approximately 5°C and the above-ground palatable vegetation available to rabbits reaches an annual low. Our study found that the milder winters in recent years resulted in the window of control starting later and ending earlier in the year, and that those windows are increasingly punctuated by warm temperatures. Overall this has resulted in suboptimal conditions for poisoning because of the higher availability of natural foods. While longitudinal records detailing the effectiveness of control operations are not available, this study suggests that the trend towards warmer winters over the past >60 years has significantly reduced the window of time for effective control of rabbits in temperate New Zealand. As winters are likely to continue to warm, alternative methods of management warrant investigation. Climate change may thus exacerbate the unwanted impacts of invasive species by reducing our ability to manage them effectively. Categories: Research update | Tags: climate change, conservation, exotic species, invasive species, protection, rabbit | Permalink. After 14 years in New Zealand, we are now in the Netherlands and I am about to start my lecturer position at Leiden University. I recently created a word cloud* of abstracts of my published papers to date. The results (above) nicely depict my work at Landcare Research. While I look forward to keeping ties with some of my research and fabulous colleagues in New Zealand and elsewhere, I can’t wait to see what my new position at the Institute of Environmental Sciences (CML Leiden University) will bring! * Word clouds are great ways to visually analyse text. Words that feature in your text more often are given greater prominence in the ‘cloud’. The number of words that make up your cloud depends on the threshold you place (effectively a minimum number of times that a word has to appear in the text). 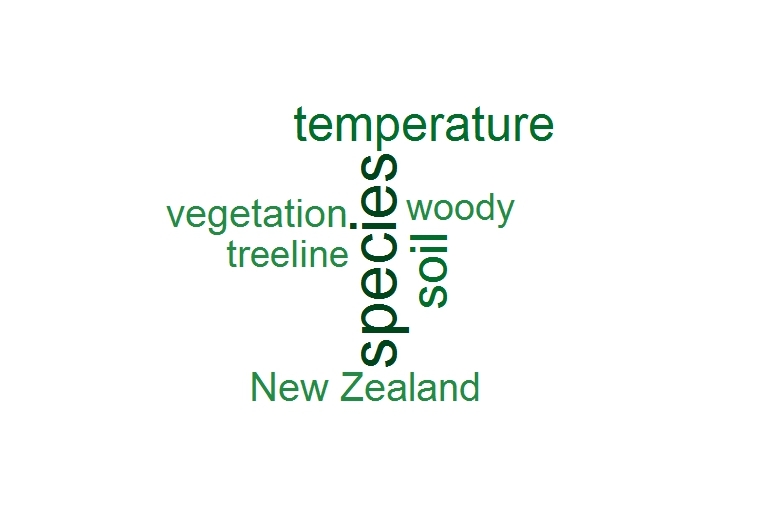 You can create these word clouds this really easy in some web applications (like worldle.net), but it’s also easy to do in R, and a lot more customisable. Categories: Research update | Tags: New Zealand | Permalink. A goal of the New Zealand Biodiversity Strategy is to ‘halt the decline in New Zealand’s indigenous biodiversity, and to maintain and restore a full range of remaining natural habitats and ecosystems to a healthy functioning state’. Meeting this goal requires knowledge of how much of the full range of natural ecosystems remains, and how well they and their biodiversity components are protected. However, reliable information is surprisingly difficult to bring together at a national level. One way to assess broad patterns of loss and protection of indigenous species habitats is to combine maps of land cover, legal protection status and the abiotic environment. The first such combination analysis was produced nearly 10 years ago, and was used to create a simple, six-category ‘Threatened Environment Classification’ that has been adopted by many agencies, decision-makers and private biodiversity practitioners across the country. Recently, my colleagues and I revised and published an updated Classification with updated land cover (LCDB4.0; based on 2012 satellite imagery) and information on protected areas for natural heritage purposes (2012), which they combined with LENZ (Land Environments New Zealand). You can find our paper here. The new analysis shows that New Zealand’s lowest, flattest, warmest and driest environments have lost high proportions of their indigenous cover and what remains is poorly protected ‒ even less so than previously estimated. In contrast, the highest, steepest, coolest, and wettest environments have been less reduced by human land use and are much better protected ‒ more so than previously estimated. Cieraad E, Walker S, Price R, Barringer J 2015. 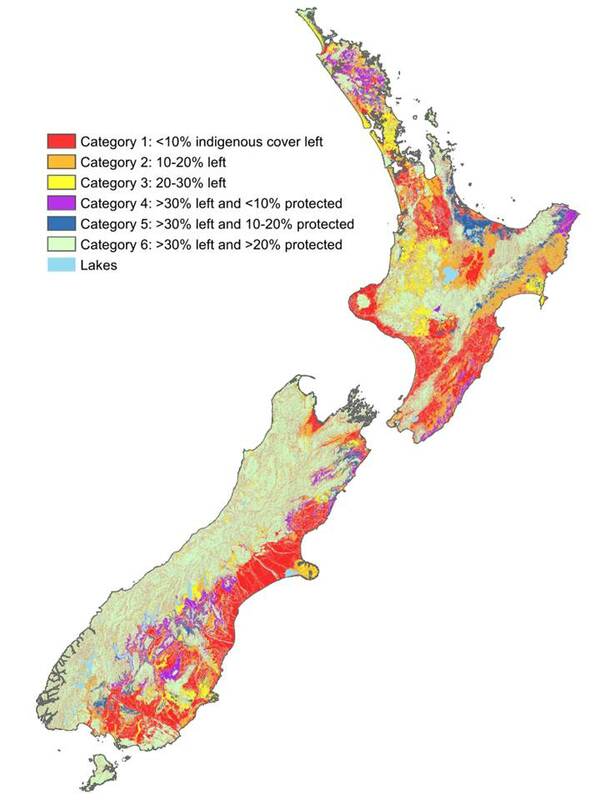 An updated assessment of indigenous cover remaining and legal protection in New Zealand’s land environments. New Zealand Journal of Ecology 39(2): 309-315. The Threatened Environment Classification provides a high-level, standardised national framework for assessing biodiversity representativeness and protection that and can assist both planning and reporting. Land in the first two categories of the classification (less than 20% indigenous cover remaining) is recognised as a priority in biodiversity protection policy, especially on private land. In combination with site survey, the Classification can help resource managers to identify places that are priorities for formal protection against clearance and/or incompatible land uses, and for ecological restoration to restore linkages, buffers and lost species. The Threatened Environment Classification is freely available, and can be accessed in several ways. The easiest way to view it and create maps is in Landcare Researches GIS portal Our Environment (under “About Ecosystems and habitats” tick “Which areas of indigenous vegetation are under threat?”). Categories: Research update | Tags: biodiversity, conservation, protection, Threatened Environment Classification | Permalink. Pikopiko Fossil Forest near Tuatapere in Southland may not be as well-known as the Curio Bay petrified forest but it has one of the richest known Cenozoic* fern floras globally. 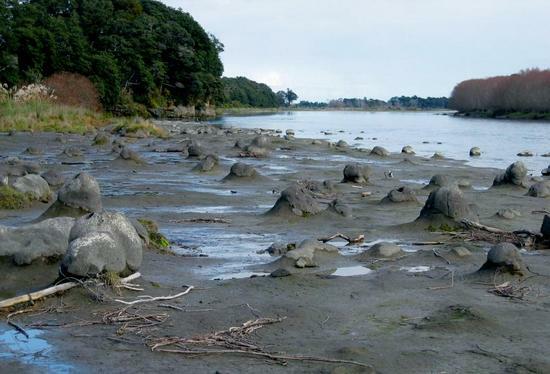 Walking in between the in situ fossil tree stumps (probably related to Araucaria) on the shores of the Wairau River, you get a sense of the spacing of the trees. Underneath your feet, the fossil litter layers provide insights into this ancient forest community. The diversity and abundance of ferns implies that ferns dominated the evergreen, tall forest understorey just as they do in modern New Zealand rainforests. Eight fern macrofossil groups (parataxa) and 20 very tiny spore types have been identified from the fossil forest. The ancient flora encompasses at least 40% of modern New Zealand fern families, which highlights the long history for some fern genera in the region. The abundance of ferns, the presence of fungi on many leaves and the presence of palms is evidence for warm humid conditions in Late Eocene New Zealand. Colleagues of mine recently re-examined fossil fern material I used for my MSc thesis together with more fern macrofossils from these Eocene strata (c. 35 million years ago), the first records for New Zealand. The results are published here. The discovery of three types of fossil fern fronds bearing sporangia with in situ spores enabled us to roughly identify the ancient ferns and show for the first time that some relate to a present day fern genus (including Blechnum, and Thelypteris subgenus Cyclosorus), some to an extinct group of uncertain affinity and some to a widely known fossil spore form taxon. Five additional fern groups, including another probable Blechnum, could be distinguished on the basis of sterile foliage. The fern flora recovered from Pikopiko Fossil Forest is significant in being the first record of fern macrofossils from Eocene strata (56 to 33.9 million years ago) in New Zealand, and they provide a wider understanding of the natural history of New Zealand during this time. *The Cenozoic period is from 65 million years ago to the present day. Categories: Research update | Tags: ferns, Fossils, New Zealand | Permalink. New Zealand has as many native as invasive plant species. A number of woody invasive species have been rapidly increasing their distribution in recent decades. In many places they are chemically or mechanically controlled often with the implicit, rarely achieved, aim of advancing the restoration of native woody vegetation. However, there may be another option: leave these exotic shrubs – they may be ‘nurse-crops’ that aid the recovery of native vegetation. This seems to be particularly effective in moist environments and where nitrogen-fixing species are involved, such as gorse (Ulex europeaus). In the drier parts of New Zealand, broom (Cytisus scoparius, another nitrogen-fixer) is a real problem, and here this species was thought to be fairly useless as a nurse-crop, until recently (see this post). In an article that is now available online, we describe a field experiment that tested how five different management treatments of broom cover affected the germination, survival and growth of native tree and shrub species. Burrows L, Cieraad E, Head N 2015. Scotch broom facilitates indigenous tree and shrub germination and establishment in dryland New Zealand. New Zealand Journal of Ecology 39(1) In Press. We imitated different management techniques that are applied to broom in the dryland zone: in some plots the broom shrubs were sprayed with weedkiller, elsewhere we had bull-dozers drive over the shrubs and leave the debris, or tractors rake all the shrubs (including their roots) and take the debris away, in other plots the shrubs were mulched and the mulch was left, and in the last type of plot, we just didn’t touch the broom shrubs and just left them standing. In all plots, we sowed seeds and planted seedlings of six native tree and shrub species. There was no evidence of unassisted regeneration of native shrubs from plants nearby during our experiment. We sowed thousands of seeds, and very few seeds germinated and even fewer germinants survived until the end of the experiment (3.5 years after sowing), but some species had much higher germination than others (particularly the hard seeded Kowhai, Sophora microphylla, germinated well). Plots where the broom cover was mulched, crushed or root-raked had very low seed germination and high mortality of planted seedlings, which was apparently due to the soil disturbance and harsh conditions of the open sites that were created. Under the living broom canopy germination and survival rates were significantly higher. This indicates that the positive (facilitative) effects of the living canopy, such as the provision of shade and a moister cooler environment in the dry summer, outweighed any negative effects (probably particularly the increased competition for moisture by the living broom shrub and the native seedlings). This study suggests that at this dry site, compared with the chemical and mechanical treatments of this woody weed, retaining a live broom canopy was most beneficial for the germination and establishment of planted native woody seedlings. Importantly, it was also the cheapest management option by far, and it may thus be an important strategy to advance the succession of indigenous woody species in these dryland weed communities. Categories: Research update | Tags: broom, exotic species, New Zealand, restoration | Permalink.